Tigers in Ashland Parking Lot! A "flock" of Tiger Swallowtails descends upon the Joe Pye Weed blooms at Ashland Nature Center. Image by Derek Stoner, July 28, 2011. Every summer a showy spectacle takes place in the corner of the Ashland Nature Center parking lot, right beside the recycling center. 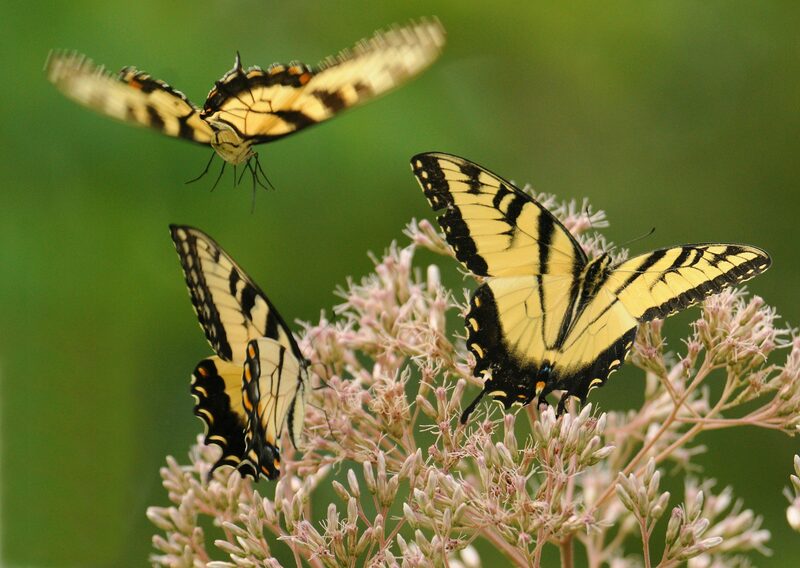 The blooming of the Joe Pye Weed attracts large butterflies in large numbers. By large butterflies, I mean the big and beautiful swallowtails. 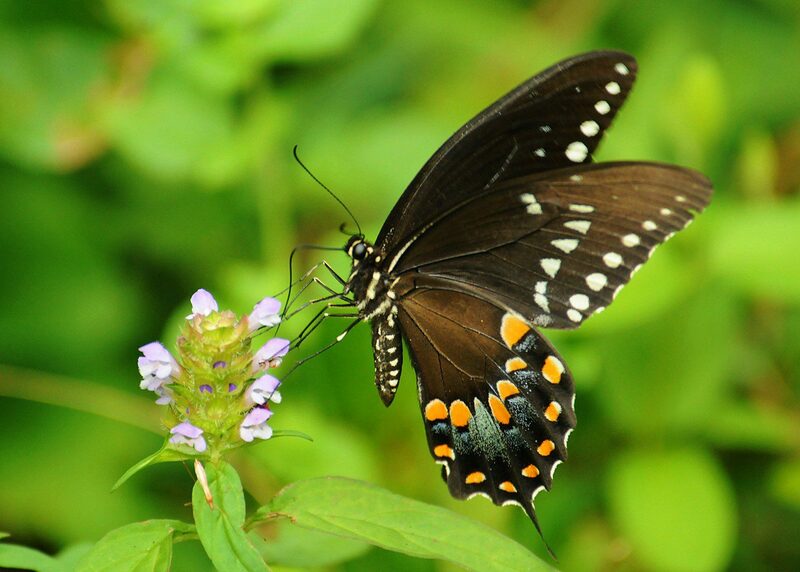 In this case, the predominant swallowtail is the Eastern Tiger Swallowtail, which happens to be the official state butterfly of Delaware. This morning I counted 14 Tiger Swallowtails enjoying the nectar at the pink Joe Pye flowers. The highest number I’ve recorded at this patch is 47 swallowtails at once, also in late July several years ago. It is interesting to watch these colorful insects joust for the best nectar sources on the Joe Pye, with multiple butterflies sometimes perched on one flower. A gorgeous Pipevine Swallowtail nectaring on mint at Middle Run Natural Area. Image by Derek Stoner, July 28, 2011. Butterfly populations are “bumping” up now, with many species being seen in strong numbers and good reports coming in from the field. These sightings bode well for this Saturday’s North America Butterfly Count– join us in the Ashland parking lot at 9:30am or 1:00pm on Saturday, July 30, to take part in this fun citizen sceince event! Great shot of the Tigers- landing gear is down! Where is Ashland parking lot. How do I get there from Ocean View, DE? Please get directions to the Ashland Nature Center from http://www.delawarenaturesociety.org. I hope you can make the count.